Sorry for not posting many entries. Now that you've extended it though, I'll make some entries today. Hooray for finally not being busy these Holidays. But I seriously thank you for making it to all my contests/challenges to take a peek at least. It means a lot, given you have had less free time than I had these Holidays! Oh no problem @murkletins! Can't wait to see what you cook up for this challenge! I decided to take a card from the Great Cardsmith Designer Search that has a ton of potential but needed some polish and revamp it. 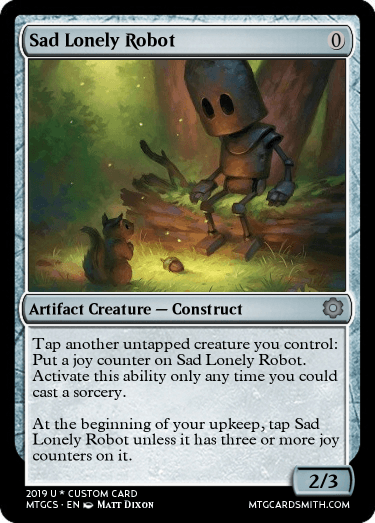 This card uses a custom mechanic that just didn’t pull its weight as a named mechanic but as an unnamed ability played just as well. I really liked the idea of scaling the creature’s power based on how many times it attacked, but a beginning of combat trigger just wasn’t the most elegant solution. By templating this ability a la Adanto Vanguard it retains the same functionality without the complexity/memory burden. 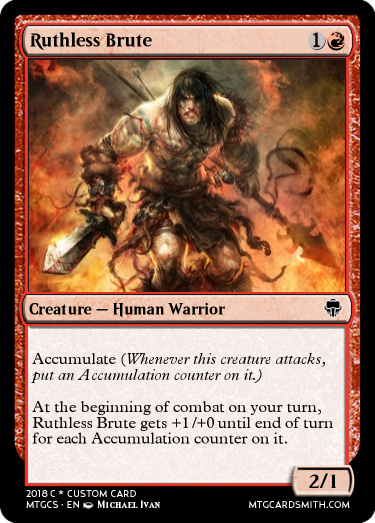 This card was a little strong as a 3/1 on the first attack so I modified its power so that it started out as a 2/1 attacking and always blocked as a 1/1 which is appropriate for a red aggressive creature. 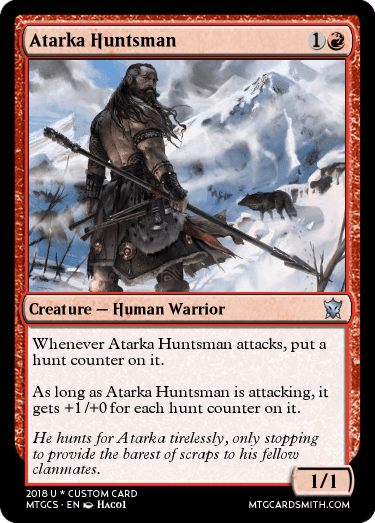 Given that WOTC avoids using any other type of counter on creatures other than +1/+1 at common, this card wasn’t a great fit there but is perfect at uncommon in terms of both power and complexity. Finally, I dressed it up in some DTK flavor to complete the package. For this contest, I decided to take an already superb card and make it better. Sorry @bnew07, I'm not trying to psyche you out. Next, I changed the card by giving protection from monsters to all of your creatures instead of just destroying a monster. I understand that Hal and Alena are monster hunters, but in the Shadows over Innistrad lore, they have made a name for themselves as defenders of humanity and enemies of the dark. 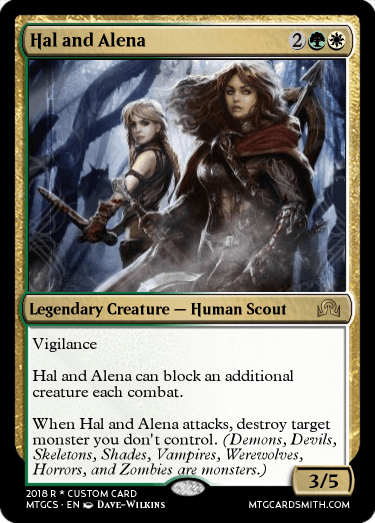 I concluded that it would make a better card if Hal and Alena were inspirational leaders and protected those who cannot defend themselves against monsters. 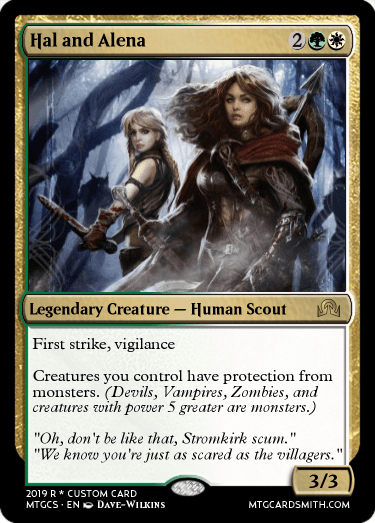 Finally, I really wanted to add some awesome flavor text for Hal and Alena, so I replaced the "block an additional creature" clause with first strike. This is the choice that was hardest for me, because it would work so well with the abilities. However, I decided that the flavor text was worth it (and maintaining the large text, because I hate small text! ), and with that, the updated Hal and Alena was finished! 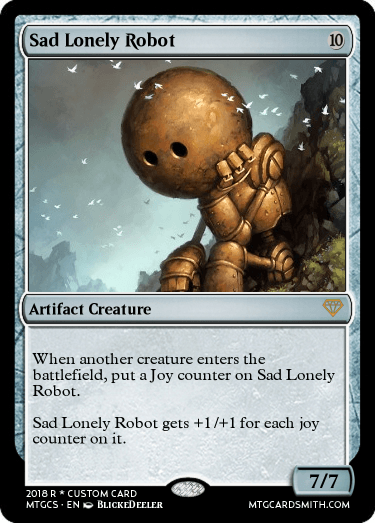 Not at all, I am glad you innovated on one of my cards. I like your changes! The artist was not listed. This contest still needs more entries, so we are extending the length of the contest unless we get an abundance of last minute entries, this contest will be open until january 18th 2019. This contest is closed for judging! Stay tuned for the results both from @dechujoh64 and myself today at some point!! So while we wait for the host of this contest's results, here is my half as the guest judge! Congratulations! Please post 3 cards you would like favorites for from me to you! Congratulations! Please post 4 cards you would like favorites for from me to you! Congratulations! Please post 5 cards you would like favorites for from me to you! As for Honorable Mention, @mlg20555 with Firestone Mountains! Congratulations! Please post 2 cards you would like favorites for from me to you! Ok so now you got my half, just waiting on @Dechujoh64's half and then this contest is completed! Thanks for having me here, dechujoh, and thanks for your guys time! Shameless plug: Please check out my new contest if you got time! "Mill is too a Strategy!" Could you favorite my most recent 3 cards, and then the next 2 I make? @mlg20555 faved your cards! Also, this is just my favorites, for all I know, @Dechujoh64 may have you placed on his side of the judging as well, granting you even more favorites! Guys specify who is to favorite what cards you want favorited as well going forward, it can get confusing. Thanks! SOrry to everyone it took me so long. I had a falling out of sorts with MTG Cardsmith (the site) as a whole I forgot about this challenge and It left my mind. For that, I am deeply sorry. As for me, I will, for the time being just make cards and maybe one challenge every 2-3 months. In third is @Corwinnn with Rema Farin. Please tell me your 3 cards you want me to favorite. In second is @Temurzoa with Hal and Alena. Please tell me the 4 cards you would like me to fav. Honorable mention goes to @shadow123 please tell me the one card you would like for me to fav. Here are my three cards to favorite! @Corwinn I have favorited the cards. Thank you for your entry and It's awesome that you spread the love around too. @Dechujoh64 Thanks for the honorable mention! Can you fave this card please?